or back issues and make a donation to COAT. Click here for a COUPON that you can print and mail. Or, you can click the "Transfer Funds" button below. Thanks! Free sample copy: If you're in Canada and we haven't mailed our magazine to you before, email your name, address and postal code. We'll mail you our next issue. and carry on loving the myths that define and confine us. This issue of Press for Conversion! examines Canadian slave labour camps during the WWI/Red Scare era, as well as other Canadian examples of mass civilian captivity from the genocidal reservation system and Indian residential schools, to WWII internment, the Depression-era "Relief Camps" that imprisoned radicals between the wars, and the Cold War program called "Profunc" which had the RCMP create annual lists of thousands of "Reds" to be rounded up in case of war, or some vaguely defined social disorder. 3M, Amdocs, Analog Devices, AT&T, BAE Systems, Bank Hapoalim, Bezeq, Bharat Electronics, CAE, Carlyle Group, Caterpillar, Cellcom Israel, Cemex, Cisco, CRH, Daewoo Engineering & Construction, Daimler, Delek, Dell, Discount Investment Corp, Doosan, Eaton, Elbit Systems, EMC, Evraz Group, Fiat Industrial, Fiat, Finmeccanica, Fujitsu, Hewlett-Packard, Hitachi, Honeywell Int'l, Hyundai Motor and Hyundai Heavy Industries. Other articles focus on: Israeli Spy Companies (Verint & Narus); top state-owned Israeli war industries (IAI, IMI & Rafael), Vertex Venture Capital. Intel, Israel Corp, Israel Discount Bank, ITT, Koninklijke, Kubota, Leumi Le’Israel, Lockheed Martin, Microsoft, Mitsubishi Motors, Mizrahi Tefahot Bank, Motorola Solutions, Navistar, NetApp, NICE, Oracle, Parker Hannifin, Partner Communications, Paz Oil, Renault, Rockwell Collins, Rolls Royce, Siemens, Sony, Tata Motors, Texas Instruments, Toyota Motors, TE Connectivity, Tyco Int’l, Valero Energy, Verisign, Verizon, VMWare and Volvo. Canada's other top pension schemes* have invested an additional $3.2 billion in the 68 firms detailed in COAT's research. See this table summarising all these investments. Sources. * Quebec Pension Plan, Ontario Teachers' Pension Plan, Public Sector Pension Investments and the Ontario Municipal Employees Retirement System. "COAT’s research on CPP investments in Israeli apartheid is a window into the accelerating militarization of a hugely destructive, global system intricately connected with, and complicit in, Israel's wars and its occupation of Palestine. "The thorough findings carefully document the corporate profits and impunity, the transnational connections, the weapons and security systems, the militarized prisons and police forces, the destruction of peoples’ lives and environments. 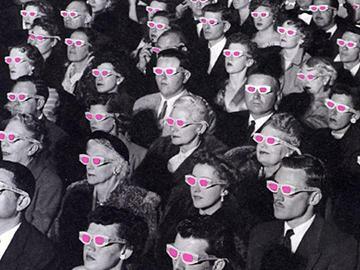 It’s a picture of a thoroughly pathological and globalized sub-society that must be stopped." 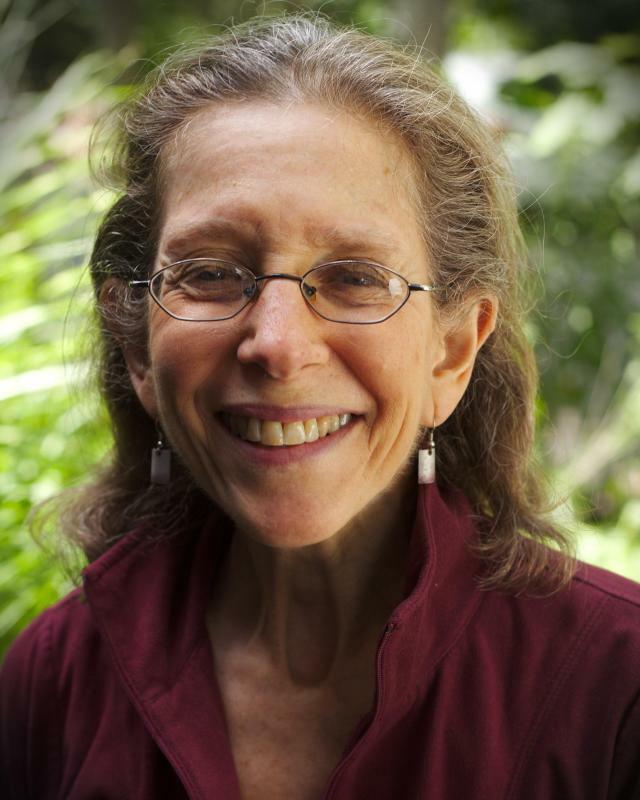 Judith Deutsch, MSW, University of California at Berkeley, is a practicing psychoanalyst and a faculty member of the Toronto Psychoanalytic Institute, University of Toronto. She is the vice president of Science for Peace, and was its president between 2008 and 2012. Judy is an active member of Independent Jewish Voices Toronto, and is also involved with climate justice research and action. 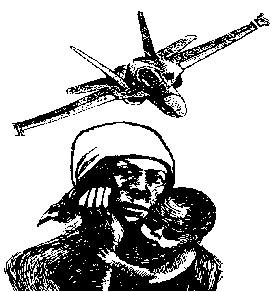 "At last the surprising truth of the Canada's military complicity in the Iraq War. A cry for peace. Brilliantly orchestrated." Canada's Quiet Complicity in the Iraq War"
Did you know that about 2,000 Canadian sailors--aboard eight, multi-billion dollar Canadian warships--participated in the Iraq War? Or that Canadian pilots flew warplanes in Iraq-war missions, including U.S. C-17s, a British MR2 and Canadian C-130s and CP-140s? Or that several Canadian Army generals received U.S. and Canadian medals for their top leadership roles in the Iraq War? These are just a few of the many facts detailed in this new 54-page report from COAT. When the Liberal government proclaimed that Canada refused to join the U.S. war against Iraq, many Canadians were understandably proud. Unfortunately, it was all a smoke-and-mirrors game. In reality, Canada did join the war in 2003 and has contributed in many significant ways ever since. * Canadian parts/services for major weapons used in Iraq. * Canada's top-40 war exporters and what they manufacture "Canada is also heavily into the weapons trade, an industry we hardly ever see covered in the business pages. According to the Coalition to Oppose the Arms Trade, between 2003 and 2006, Canadian military exports totaled at least $7.4 billion, mostly to the U.S, where it went into the weapons used everywhere from Iraq to Gaza.... But there’s no business like the war business, as the U.S. has demonstrated time after bloody time." Antonia Zerbisias, "My Canada includes war, environmental degradation and lost causes," Toronto Star, March 31, 2010. "One of the best sources for information and background on Haiti is the Coalition to Oppose the Arms Trade. I urge you to visit the site. We all, me included, need to know the terrible details of our destruction of democracy in Haiti and our continued complicity in the repression of the population.... [W]e need to be holding the Harper government to account for the current militarization of the disaster response." Murray Dobbin, "Mea culpa on Haiti," January 25, 2010.
to justify Haiti’s 2004 coup"
(5) The big lie: "no political prisoners" during coup regime. This issue also contains articles on: (a) the demonization of Vodoun and the politics of religion, (b) a CIDA-funded group in Haiti (NCHR) that concocted lies that were spread by CIDA partners in Canada, (c) how CIDA groups adopted the Haitian elite's racist epithet, "chimère," to tar all prodemocracy supporters as if they were violent thugs. "I have spent the better part of two decades living in Haiti, trying to sort through fact and fiction to explain what has happened here. The lead article in this issue ("Demonizing Democracy: Christianity vs. Vodoun and the Politics of Religion in Haiti) , is a well-balanced resource about how bigotry against voudou was used to create accusations against Aristide and his associates. What makes this research most special is that to my knowledge no one else has documented the extreme slander of these accusations and the political orientations of those who orchestrated and publicized such lies. It's incredible that people get away with fabrications that destroy lives and help undermine an entire nation, but are never held accountable. It's a great service that a person does when he or she honestly documents, and commits to the historic record, the very real crime of character assassination." Alternatives, Canadian Foundation for the Americas, Centre for International Studies and Cooperation, Couchiching Institute on Public Affairs, Development and Peace, Freedom Network, International Legal Resources Centre, Québec Association of International Cooperation Organizations, Rights and Democracy, and Roundtable on Haiti. Human Rights Atrocities, one Haitian 'NGO' at a Time"
This issue of the magazine exposes ten ways in which Canada's Liberal government was complicit in (1) aiding and abetting the 2004 coup d'état that ousted President Aristide's democratically-elected government and (2) supporting the illegal, coup-installed regime that was responsible for two-year human rights catastrophe that followed. In early 2004, a U.S.-funded, trained and armed paramilitary force of former CIA-backed death squads and disbanded military men attacked Haitian police stations, massacred government supporters and released human rights abusers from prisons. The U.S., Canada and France did nothing to assist Haiti's beleaguered government but actually demanded that it share power with representatives of Haiti's wealthy corporate elite that had lost the 2000 elections and supported the rebels. On February 28, President Aristide was kidnapped and forced into exile by U.S. Marines, with help from a foreign occupation force of Canadian and French troops. That day, Haiti's popular government—which had a clear mandate to govern until 2006—was illegally replaced by a puppet regime approved by Aristide's opposition, the occupation governments and the UN Security Council. This brutal, coup-installed regime was responsible for a two-year reign of terror in which thousands of prodemocracy supporters were executed and many more jailed without charge. "In conducting my preparatory research for my field trips into Afghanistan, one of the most useful references has been Issue #59 of Press for Conversion! This catalogue of Afghan Warlords turned politicians has proven to be a handy guide prior to my numerous interviews with many of these same nefarious characters. In fact, that dog-eared copy of Issue #59 has accompanied me on all five visits to Afghanistan." the Fundamentalists, Warlords and Drug Barons"
Click above for separate links to articles in this issue. A phony democracy – dominated by warlords, drug barons, oil industry representatives and World Bank administrators – has now been successfully imposed upon Afghanistan by the world's major military and economic powers, including Canada. The current issue of Press for Conversion! outlines the key steps in the supposedly “democratic process" that brought this government to power. The process began very soon after 9/11, which offered a convenient pretext needed for U.S. air strikes that began on October 6, 2001. Some 3,000-3,400 innocent civilians were killed during the first six months of that U.S. bombardment alone. Thanks to the subsequent military, financial and diplomatic efforts of American, Canadian and other NATO-member states, many of Afghanistan’s most violent and dreaded terrorists are now back in power, running the country's government. There has been an appalling litany of scandals surrounding this supposedly "democratic process" that aided and abetted the return to power of our closest allies in Afghanistan, the notoriously-brutal, fundamentalist "Northern Alliance" warlords. RADARSAT, is probably Canadas single-most important technological contribution to the militarisation of space and U.S. warfighting. It cost Canadian taxpayers about $1 billion to produce the world's most advanced commercial satellite system. U.S. military and intelligence agencies are among its top users. In exchange for launching RADARSAT-1 in 1995, the U.S. government directly controls 15% of its observation time and has used it in Intelligence, Surveillance and Reconnaissance during the wars against Yugoslavia, Afghanistan and Iraq. When the Liberal government privatised RADARSAT--giving it to Vancouver's MacDonald Dettwiler and Assoc.--this firm was wholly owned by a U.S. war industry that builds "missile defense" rockets. 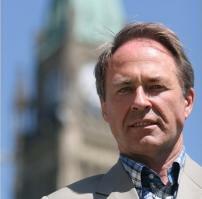 (MP David Emerson was on MDA's Board of Directors.) U.S. and NATO warfighters used war games to practise using RADARSAT-2, particularly in its most coveted role: the tracking and targeting of moving, ground vehicles. The exploitation of this data was developed by Canada's Department of National Defence in collaboration with the Ballistic Missile Defence Organization. Together they developed plans to use RADARSAT-2 data in the first-strike attacks of "Theatre Missile Defense" operations. The idea of this missile defense is not to protect the homeland but to defend missiles, troops and warships deployed to distant war zones. Article by Press for Conversion! editor Richard Sanders summarising Radarsat's role in the militarisation of space. "Richard Sanders' work on Radarsat has been of great value in understanding this 'commercial' satellite system and other satellite systems' importance for warfare around the globe, like in Iraq and Afghanistan. There is a national-level agreement between Canada and Norway on the use of Radarsat. There are lots of parallels between Norway and Canada in this field because both are polar nations with strong relations to the US. I have tried to widen this perspective, so hopefully my book is of interest to everyone who wants to understand how war is changing because of this new technology." 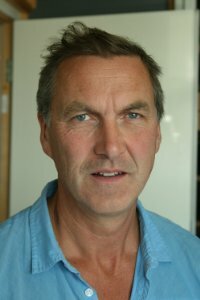 Bard has been a journalist for 25 years and now works for the Norwegian Broadcasting Corp. 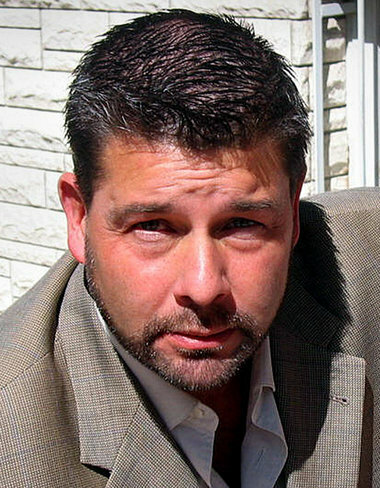 He is the author of an excellent book called The Satellite War, which can be ordered as a paperback. Part II: Sea-based, Theatre Ballistic Missile Defense"
This issue contains more, original COAT research on Canadian contributions to the creation, development and deployment of "missile defense" weaponry, with a particular focus on sea-based systems within the Theater Missile Defense (TMD) program. TMD is at the cutting edge of what is popularly known as missile defense. Although the purpose of "missile defense" has been sold to the public as a system to protect them from rogue states and terrorists, its real purpose is altogether different. The reality is that before long, the advanced weapons systemsthat are now being developed under the protective guise of "missile defense"will be used for offensive purposes. Their role will be to protect troops, warships and their offensive weapons systems during wars of aggression. As usual, Canadian government, corporate, military and scientific communities have been, and still are, very deeply involved in this U.S.-led effort to build the most advanced tools of war ever seen. The contributions to missile defense made by these Canadian companies is examined: DRS Technologies Canada, ITS Electronics, Lockheed Martin Canada, Meggitt Defense Systems and Telemus. Canada's supposed no to "missile defense" was a completely meaningless, PR gesture with no real or practical significance. The fact is that Canada's government did not do anything at all to stop the many already existing forms of Canadian complicity in missile defense. Neither did if prevent further participation in this U.S.-led weapons development program. The Liberal's "no" was cleverly designed to deceive the public, cover up existing involvement in these advanced weapons programs and to buy support for their failing minority government. The lie that Canada was not involved, was swallowed hook, line and sinker by the mainstream corporate media. Many peace activists, including some of the most high-profile opponents of "missile defense" in Canada erred when they accepted the government's ploy and claimed victory. By spreading such statements as "We win on missile defense!" and by naively congratulating the government for "not joining," many peace activists fell into the government's trap. This error has gravely undermined real efforts to stop Canada's ongoing role in the most comprehensive weapons development program in world history. This issue looks at the collaboration in "missile defense" by various government departments, agencies and crown corporations as well as Canadian companies such as: ATCO Frontec, AUG Signals, Bristol Aerospace, CAE, CMC Electronics Cincinnati, Cognos and COM DEV International. 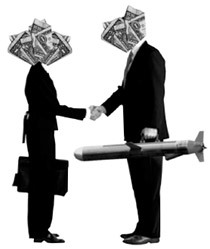 Trojan Horse for the Weaponization of Space"
(1) Subsidizing corporate welfare bums: Multibillion-dollar arms industries are making a killing; Taxpayers are footing the bill. (2) Global military/economic control: With American space weapons able to attack targets anywhere on earth, the U.S. will control the ultimate, military "high ground." Using many quotes from military documents, this issue shows that the U.S. plans to wage wars from space to expand American control global resources and other commercial interests. President George W.Bush's grandfather (Senator Prescott Bush) and his great-grandfather (George Herbert Walker) built vast fortunes that were later used to launch the careers of George Herbert Walker Bush and George Walker Bush. This is how the two George Bushes could afford to get their start in the oil business as well as the slick business of politics. 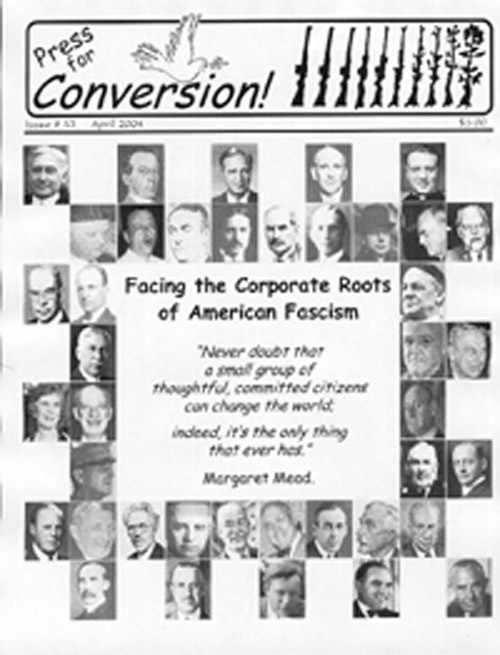 This issue of COAT's magazine provides shocking evidence showing that Prescott Bush and George H.Walker were the financial managers of well-organised American effort to funnel the investments of right-wing U.S. bankers and industrialists into Germany which funded the rise to power of the Nazi Party and Adolph Hitler. During WWII, the banking house of Prescott Bush and George H. Walker profited from companies that used slave labour at the Auschwitz concentration camp. Then, after the war, these forefathers of President George Bush helped launder Nazi loot in the U.S. U.S. intelligence agencies were then complicit in covering their tracks. The ill-gotten financial empire was used to launch the careers that eventually put two George Bushs in the White House. 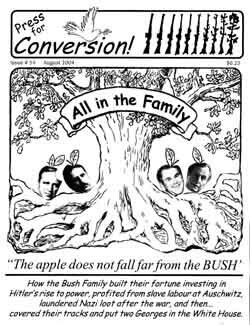 This issue of COAT's magazine also looks at the political actions of President George W.Bush, and his father President George H.W.Bush and shows that they continued the political and economic legacy of fascism that was begun by their forefathers. "Facing the Corporate Roots of American Fascism"
Few realize that during the early 1930s, there was a homegrown fascist plot to overthrow the U.S. government and install a dictatorship. This plan was however thwarted by Marine Corps General Smedley Butler, who was then the most popular military leader. Butler pretended to go along with the conspirators in order to learn who was behind it. He then blew the whistle by testifying to a government committee on "unamerican activities." Butler named the corporate leaders who he had discovered were planning to oust President Franklin D. Roosevelt. The committee however did not pursue the main culprits behind the fascist plot and did not include many of their names in their report. This incensed Butler who then held press conferences and went on the radio to name the top corporate leaders behind the plot. This issue contains original research examining who these American fascists were. They were associated with a powerful organization called the American Liberty League. Many of the companies that the plotters owned and controlled are now among the world's wealthiest corporations. As it turned out, they did not need to go ahead with this plot in order to regain control of the White House. Find out who the plotters were, who financed them and how they schemed to overthrow the White House and empower a fascist government in America. View this whole issue as a pdf here. This issue is filled with detailed analysis of the many ways in which the Canadian government and corporations are deeply embedded in the U.S. war machine. For example, the Canada Pension Plan invests in Americas biggest war industries, including those producing dozens of major weapons systems used in the Iraq war that began in 2003. This issue has original COAT research listing 100 Canadian military companies that have provided parts and services for the major weapons systems used in Iraq. This issue also exposes statistics on the how the Canadian government has over the past few decades given billions of dollars to Canadian arms industries that have aided and abetted US wars and invasions. Also revealed is a the flow of financial support from Canada's military industrial complex into both the Liberal Party and the Conservative Party. This issue provides detailed evidence showing that over the past decade, war-related corporations in Canada have given millions of dollars in political donations to these parties, and that the primary recipient of this corporate largesse has been the Liberal Party. Mr. Martin said his motion was inspired by a recent study by the Coalition to Oppose the Arms Trade, which linked CPP investments to top U.S. military contractors." "Invest pension fund ethically: NDP motion,"
Ottawa Citizen, February 8, 2004. Algeria, Egypt, Iraq, Iran, Israel, Lebanon, Libya, Palestine, Saudi Arabia and Syria. 1846: The Mexican-American War; 1898: The Spanish-American War; 1915: World War I; 1941: World War II; 1950: The Korean War; 1954: The Covert War Against Guatemala; 1962: Plans to Create Pretexts for War with Cuba; 1964: The Vietnam War; 1979: The Covert War in Afghanistan; 1983: The Invasion of Grenada; 1986: The Bombing the Libya; 1989: The Invasion of Panama; 1991: The Gulf War; 1999: NATO's War Against Yugoslavia; 2001: The Afghan War and the "War Against Terror;" 2003: The New Iraq War. (Project is on hold.) "One of the main barriers to opening people's eyes all over the world about the reality of US foreign policy is the deeply ingrained belief that America Means Well. So, no matter how horrible a particular intervention turns out (see, currently, Iraq), the public remains convinced that the intentions are noble (bringing democracy and freedom). When you show that a war or other intervention is based on a contrived pretext, it becomes much more difficult for the public to accept the idea of noble intentions. It makes people more skeptical and cynical, which they should be. This is what [COAT coordinator] Richard Sanders...hopes to achieve." Third World since World War II. (4) establishing military bases in Iraq in order to pursue the more ambitious imperial quest to control valuable strategic resources in the Middle East, Central Asia and elsewhere around the world. This issue contains a wealth of original COAT research about militarised war shows. So called "air shows are in fact the world's biggest military propaganda exercises. These events are elaborate "psychological operations" designed to build public support for warfighters and their use of "air power" in state-sponsored violence. War shows also serve other major functions, such as the indoctrination of children and the recruitment of youth into military career paths. This issue examines 27 of Canada's largest war shows in great detail and reveals that 82% of the almost 400 aircraft that were used to entertain huge crowds at these spectacles were military. And, sixty percent of the military planes that "performed" in Canada at these events were fighters, bombers and military transport planes of the US Air Force. This issue lists all of the wars in which these warplanes have been used. It also looks at the weapons of mass destruction that they have been used to "deliver" to targets around the world. Read more about COAT's 30-minute documentary: "Mothers' Day at the War Show." View the documentary online now. This issue begins with a series of articles examining the historical context of the conflict between India and Pakistan. Much of the blame is laid on (1) British colonialism, and its "divide-and-conquer" policies that culminated in partition, and (2) the U.S. use of Pakistan as a military client state during the Cold War. When the CIA fought its biggest covert, proxy war in Afghanistan, it used Pakistan as a conduit for arming, financing, training and equipping the fundamentalist, Islamist mujahadeen. This was a deliberate effort to provoke the Soviet Union to become embroiled in the war. This US support for terrorism had its repercusions on Indo-Pakistani politics. The particularly thorny issue of Kashmir as a potential flashpoint for nuclear conflict, between India and Pakistan is also explored in a number of articles. Also examined is the issue of the arms trade and Canada's role helping to arm these two countries. Published not long after 9/11 and the illegal U.S. invasion of Afghanistan, this issue takes a radical look at the underlying purpose of this war and the military occupation that followed. To understand the real economic and geopolitical reasons for this war, it is necessary to realise that the vast oil and natural gas reserves of Central Asia, particularly around the Caspian Sea, are highly-coveted by the US and others. Afghanistan is needed as a ruote for a pipeline to get these resources to the Persian Gulf so that they can be shipped to market. This issue looks at the origins of corporate globalization and contains many informative articles that explore the important links between war, militarism, big business and the increasing power that corporations wield over governments around the world. Among other things, this edition examines the important contribution played by military industries in making the world safe for global capitalism. (4) Canadian government promotion of arms bazaars and other foreign "business opportunities." Bangladesh, Brazil, Chile, Egypt, Indonesia, Israel, Korea (South), Malaysia, Morocco, Philippines, Saudi Arabia, Singapore, Taiwan, Thailand, Turkey, UAE and Venezuela. "Very clearly the concern is about the sale of military supplies to countries that are engaged in human rights abuses. Press for Conversion has published a number of very powerful indictments of Canadian policy in this area, such as selling weapons to countries like Saudi Arabia which we know has a terrible human rights record or Turkey which is engaged in a brutal repression of the Kurdish minority. Surely there should be far greater scrutiny of these operations. To the extent that this corporation [the Canadian Commercial Corp.] is facilitating and supporting these kinds of sales we would want to ask some pretty tough questions." (3) useful resources, including organizations and publications. Although most of the articles deal with Canadian complicity in nuclear weapons, there are also articles on the US and elsewhere. Just click PayPal's "Transfer Funds" button below to purchase a copy (or copies) of our magazine, to subscribe, renew, order a copies or make a donation to COAT. Thanks in advance for your interest and support! Click above to receive occasional email updates about COAT's work. Thank you for visiting the COAT website. Hope you found it useful and interesting. Please contact us with any ideas, comments, suggestions or offers to help.